3D Printing advice #Day 2. The original advent calendar from 2012 is on Thingiverse - designed by from Peter Leppik. Day #2 of Advent 2017. The mini-spool is designed to be printed in three parts, the coils are going to be made using Colorfabb Brassfill. Read below, this is a tricky material! There was only really one choice for the spool, it had to be made from recycled plastic, so I'm using ReForm rPLA filament from Formfutura. 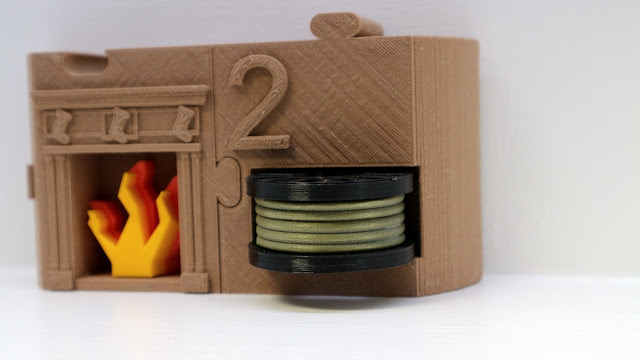 This filament also comes as standard on a cardboard spool, and cardboard box. It's really easy to use and provides great results. 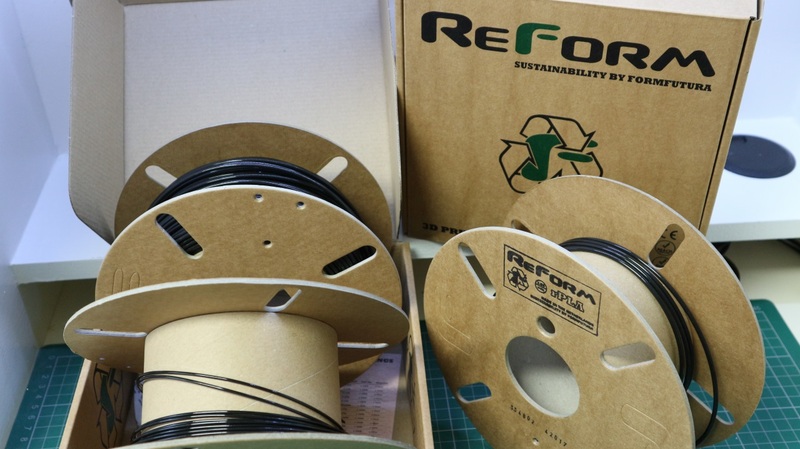 Formfutura sell rPLA, rPET and rTitan materials all recycled plastic and on cardboard tubes. I have been using these for months and currently it's my top pick of sustainable #3DPrinting consumables. I'm also testing out other recycled materials (and very interested in any others...), so do check back for more materials and to see what suppliers are promoting both recycled materials and sustainable packaging. Mini-spool (outer) printed in Formfutura ReForm rPLA. 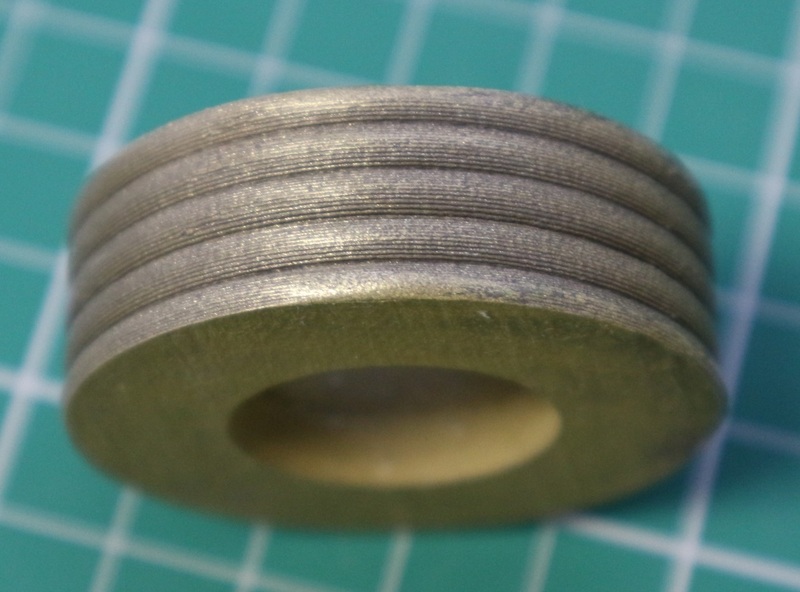 Mini-spool (Inner coils) printed in ColorFabb Brassfill (1.75mm). 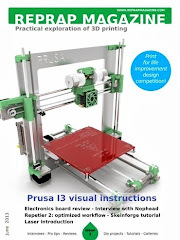 If you manage to get a completed and finished 3D Print - Congratulations! That really is great and 99% of the work. But next you will probably want to polish / shine the Brass object (My Precious!). You have lots of choice for metal polishing - you can tumble the part, sand it, use some industrial polishing compound, or an off-the-shelf metal polish. 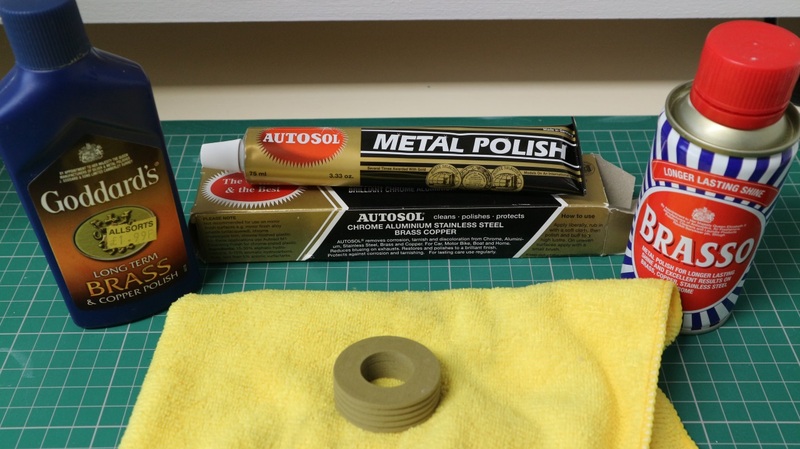 I mostly use a combination of Autosol to start, then some Brasso and some brass/copper polish to finish. Next you need some polishing devices / brushes, pads, sandpaper or other lightly abrasive things like steel-wire wool or a scouring pad. I almost always use a shoe cleaning brush (brass/suede type) Shown above from Clarks. A selection of other brass / nylon (even a toothbrush) brushes are a good idea. A micro-fibre cloth is really essential too. 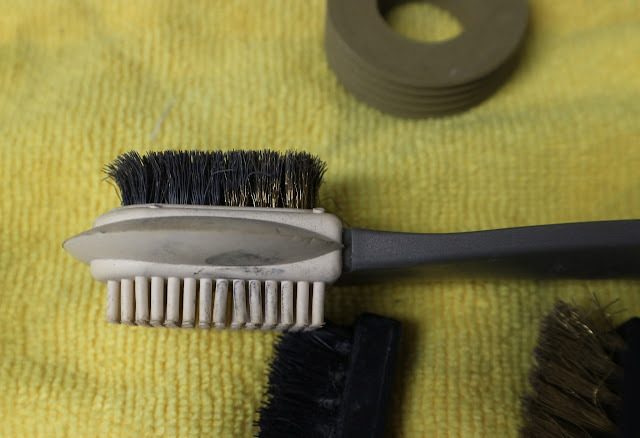 You can decide to sand the part first, but I often jump straight into brushing / polishing. 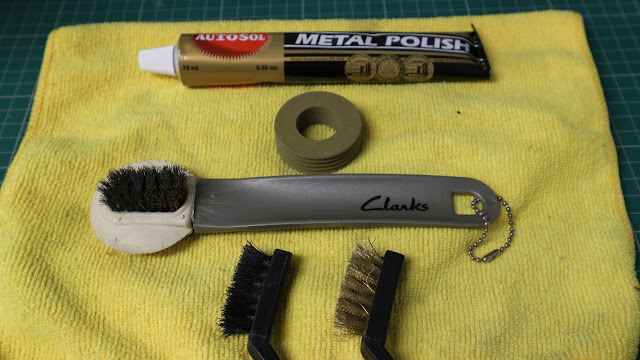 Add some Autosol polish and brush with the Clarks shoe brush - brass side - brush along the layers, not across them. After a few minutes you should have the following buffed-up with the brush and polish. Now you need to do more brushing, and ideally use an abrasive pad (dish-washing- scouring pads are ideal). Remember to also use the micro-fibre cloth and a little Brasso to get the shine back. When things look smooth enough for you (you may not want completely smooth) - I like to still see the 3D printed texture on my parts. You could carry on, and end up with an even more gold like finish. I stopped here because I wanted some texture to remain. There we have it. Day #2. Done. Before deciding to use Brassfill, be aware it's still listed as an experimental (beta) material by Colorfabb. It's more delicate and tricky to use than both Bronzefill and Copperfill. But it does look great, feels heavy (quality) and can be polished to a gold-brass finish. What settings did you use? - 210 Degrees C and a 60 Degrees C heated bed. 0.2mm layer height is fine, but you can go lower. 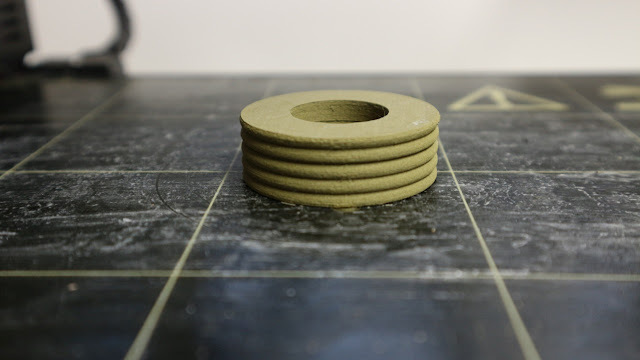 Use a 0.4mm nozzle or larger - don't use really tiny nozzles under 0.4mm, they will clog. 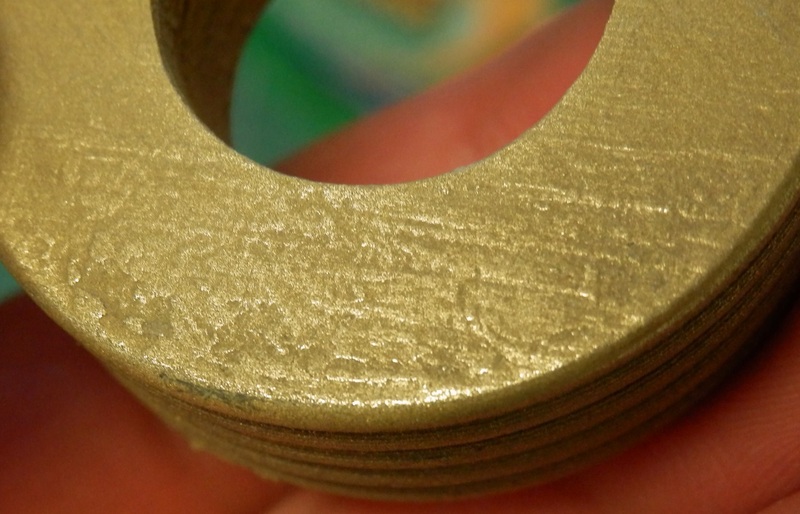 Use a higher number of top/bottom solid layers (I use 5 @ 0.2mm) to give a good finish. Print speed - it's good from 10mm/sec to around 60mm/sec - Don's be too aggressive on your extruder feed and retraction - I usually turn down retraction speed to 15mm/sec (normal is 32mm/sec). Add around 20% to your extrusion multiplier (120% total) for Brassfill. Don't print more than one object at once - you will have more success with just one object in the middle on the build platform. 16% infill and two perimeters for this model. Why use it? - It's still the only true Brass filament (I believe?) and it can have amazing & unique results. Is it strong? - Not really - In filament form (especially 1.75mm) it's really delicate to handle, and gets more brittle over time sat on the reel. You need to be very careful when feeding it into your machine. The filament coils do not want to be forced out of their existing bend radius. It's also not good to use it in a bowden tube configuration.When printed it has very good layer bonding, with a matt slightly rough finish. Polished parts feel strong and high-quality because it's such a heavy material. Small printed features will snap off models, small parts are quite brittle even when printed. It's best used for a bust, or solid model with surface features you want to show off / polish, rather than spindly 'tree-like' objects. 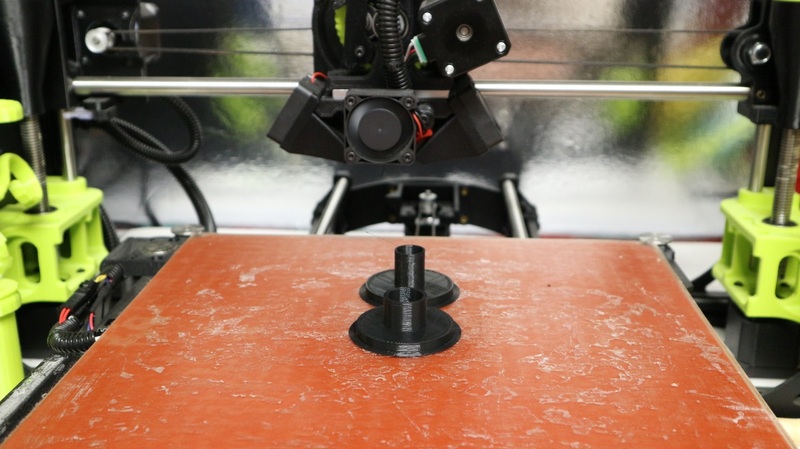 Is it easy to use/print - It's straightforward in terms of settings, but handling the material and choice of extruder is quite hit-and-miss for many users. Make sure your extruder is not clamped too tightly onto the filament (it will bend/break/buckle/grind, jam) - Use 200-210 Deg C settings to start with, then tune print speed for ability of the extruder - My advice would be not to print unattended because the filament may/will break and require you to re-insert etc. It snapped three times during this model print. Pause, remove filament end, re-insert coil and continue. Do you have to dry it before/after use? - No (but keep reading) - Keep it dry and sealed in the bag. My top-tip for Brassfill is if you notice the coils are becoming brittle, dry and also warm up the filament on the reel (in a low temp oven). I have found this tends to make it easier to handle, it becomes less brittle and also prints more smoothly. Do i need a 'special' nozzle? - Yes, it's 'soft', but still abrasive. 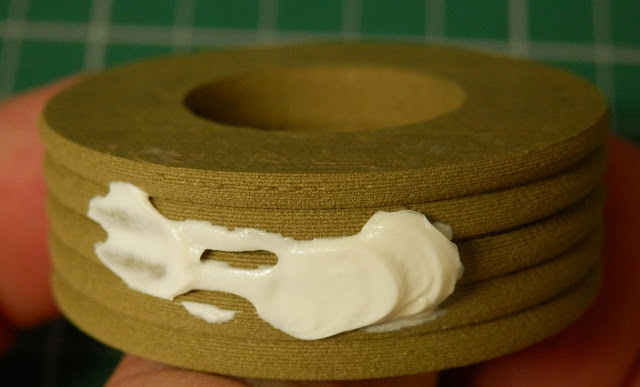 Use a 0.4mm or bigger nozzle. It will work fine with Stainless, Hardened steel, or Ruby nozzles. If you manage to use an entire reel, you may see some slight nozzle enlargement with Brass nozzles. Does it come on a eco friendly spool? - No, it's the normal ColorFabb (PC) Polycarbonate Spool, but we hope to see Colorfabb introduce Eco-friendly BioFoam PLA spools in 2018. Stay tuned for more info. Conclusion for ColorFabb Brassfill - Great when you get skilled in using it on your machine, (warning expensive failures!) - It can produce a fantastic, unique and stunning finish. You just need to handle it carefully. 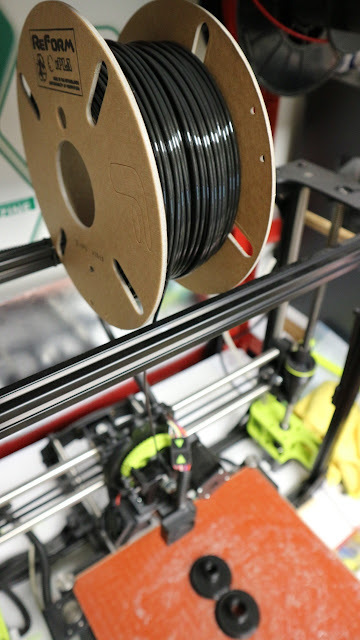 Also be aware you do not get quite as much volume on a spool, it's a heavy, quite costly material, but so worth the effort.